The newest addition to the StarBase 118 fleet is the USS Doyle, NCC-80221-A, a Luna class explorer. Named after Scottish physician and writer Sir Arthur Conan Doyle (1859-1930) and one of New Scotland’s moons, the Doyle-A was launched on stardate 239204.02 under the command of Captain Shelther Faranster. Many of the Doyle‘s senior staff had previously served with Captain Faranster aboard the USS Constitution-B, a Galaxy class starship. Designed by Dr. Xin Ra-Havreii at Utopia Planitia Fleet Yards on Mars in the early 2370s, the Luna class was initially conceived for exploration of the Gamma Quadrant following the discovery of the Bajoran Wormhole and has since become one of Starfleet’s premier exploratory and research vessels. Luna class vessels are equipped with a dedicated sensor pod at the back of the saucer section, allowing their crews access to enhanced sensor nets and data collection grids that rival many advanced space telescopes. The sensor pod itself is manned by up to eight crewman at a time, and a special suit allows an operator to directly control and manipulate probes fired from the pod. To get an inside look at these technologies and more, I sat down with Lt. Commander Benjamin Hunnicutt, the man tasked with taking care of her as chief engineer, and Lieutenant Ceciri Ariadust, the Doyle‘s helm/com/operations (HCO) officer, to learn more about what makes the Doyle special. Thank you both for chatting with me today. Why don’t we start by learning a bit more about each of your backgrounds. Commander Hunnicutt, the Doyle is the fourth starship on which you will serve as chief engineer, yes? Can you tell us more about your career in the fleet? Hunnicutt: Wow, seems more then four… I started off on the Victory as a fresh faced ensign, and it just exploded from there. Then, it was the Constitution-B, Eagle, and then the Constitution-B again. I’ve got plenty of stories but I won’t bore people with them. And Lieutenant Ariadust, you had previous experience in starship operations before Starfleet. Tell us a little more about that. Ariadust: Ah, yes. I was the pilot-engineer for a series of merchant ships – well, three, really, but that’s more than most merchants like to go through in eight years – from when I was 13 till about… ::pauses. :: 21, in Federation standard years. I also became the purser, and often organized loading and unloading in ports. How did you find adapting to Starfleet practices and working with Starfleet equipment? Ariadust: Rather interesting. It’s nice to work with equipment that is easier to maintain and has a higher engineering standard. Although, most of Starfleet’s practices merchants would love to adopt, it’s just the financial and space barrier preventing them. There are a few that baffle me, but it comes with the job. Beats scrambling for power cores from salvage in a patched EVA suit any day! 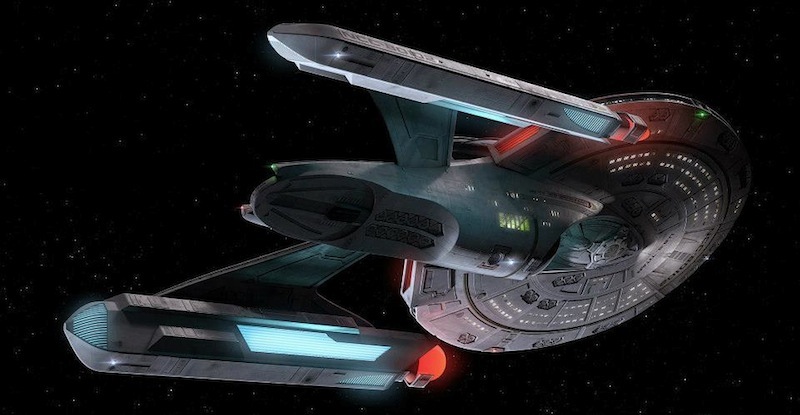 The Luna class is one of Starfleet’s newer designs. What in particular would you say are the strengths of the Luna class and the Doyle? Hunnicutt: As Chief, it’s hard to find just one strength. One thing that stands out is the shield output: they can take a bit more of a beating than the shielding from the other ships I was on. Ariadust: The strength I greatly appreciate is the sensor suite. It makes my job of coordinating between decks and tracking nearby objects easier and keeps us well informed as our science department can much more accurately track and analyze various phenomena. Are there any features of the Doyle that make her unique compared to other Luna class ships? Hunnicutt: She’s named after Sir Arthur Conan Doyle; do I really need to say more? One of the greatest minds from the past, I think that suits the Luna class down to a t.
Ariadust: Ah… well. We have a period bar, from Victorian England. I’ve had to look up why, but once it was explained to me the associations humans make with the name, I have to say, it fits. How would you compare the Doyle to your previous ship, the Galaxy class USS Constitution-B? Anything that stands out in particular? Hunnicutt: The quantum slipstream drive, just because being an engineer, it’s something new to play with. It’s like a bright shiny new toy! Just having the extra speed that the Conny didn’t have makes me feel like a kid again. Ariadust: Besides the new ship smell… ::smiles to herself at a thought:: Much more nimble. Much more able to perform long-range investigations, since we can get closer now to various anomalies. I’m looking forward to discovering new things, and growing more into my role as HCO. Lieutenant Ariadust, you mentioned the sensor suite. Can you tell me more about what makes this feature different from other ships or a little more about the technological advances incorporated into it? Ariadust: Well, several lessons from the Aurora and Avandar were incorporated into the palette, giving it enhanced subspace impulse detection. It allows for much better identification if you’re using it to identify engine tracks from a distance or if you’re mapping rifts and anomalies, for example. Also, a few of the programs were optimized, which gave it enhanced processing time. Commander Hunnicutt, what would you say is the overall design philosophy of the Luna class? What kind of missions is she built for and what makes her best suited for these roles? Hunnicutt: The design philosophy, I guess, was the need for a new long-range explorer. 100% exploration through and through, something smaller and an update from what we used beforehand. What makes her suited for these roles would be as we said the new sensor suite and the fact that we can use her as a testbed for experimental science and sensor technology not yet used on other classes. And then for both of you, is there anything you’re working on to “tweak” the ship past her standard specs? Or are either of you working on any special projects right now? Hunnicutt: I really haven’t had a chance to start on any projects. I have a few in mind, but they are still in the preplanning stage. As soon as I get time to sit down and think, I will be able to put them into action. But then again, knowing the captain, I’m sure he has other plans. Ariadust: Right now, I’m working on something like a personal forcefield drone. It’s undergoing some physical trials before I submit it for formal testing by the SCE, but after recent events, I think I’m going to look into the security of the communications systems and make it more robust. It’s an idea. Our thanks to both Commander Hunnicutt and Lieutenant Ariadust! To keep up with the latest adventures of the Doyle, be sure to check out their monthly news update on the FNS or visit their homepage.